​Humans have been using marble in their art and architecture since ancient times—and with good reason. It's smooth, beautiful, strong and every piece is unique. While most of us are the most familiar with white marble laced with grey, you can find this timeless stone in pinks and greens, blue and black, too. Prized as a symbol of taste and of tradition, marble in home decor brings to mind a look of classical elegance. That said, marble has gotten a modern makeover as of late. 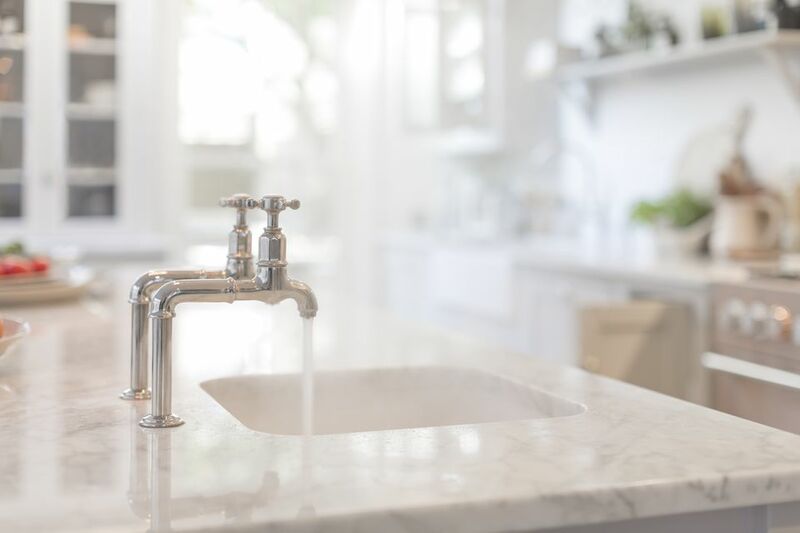 In just about every major home and furniture store you can find touches of marble—from lamps to tables, trays, bowls and more. Ahead, we've gathered 15 of our favorite marble home accents that are sure to add some old world charm to your decor. Marble cheese knives for entertaining. Even if you're just serving cheddar cheese and Triscuits, any appetizer will look purposeful and fancy if you serve it with marble. 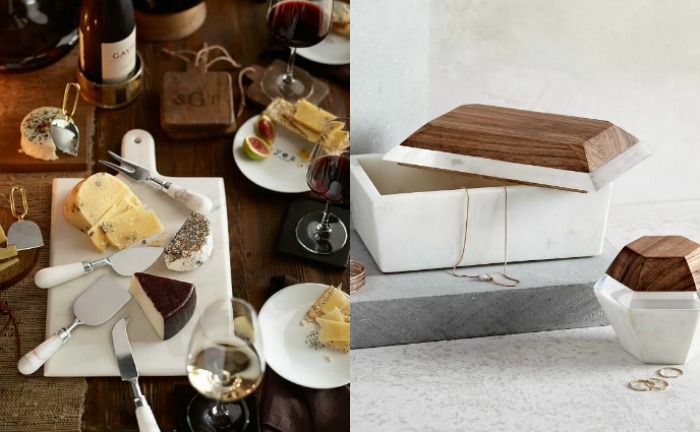 We love these cheese knives from Pottery Barn that will class up any cocktail party at home. Marble bowls for display or the kitchen. Whether you use them for display or for serving, a marble bowl like this one will not go unnoticed in your kitchen. If you're looking to decorate your home and strike a balance between the masculine and feminine, a bar set like this will do the trick. The shining metal and slim legs of this 3-piece set are elegant, while the marble top adds some real weight. (Plus we love the small storage shelves to the side, for art even bar supplies. A serving tray for an elegant cocktail hour. This elegant coffee table is ideal for small or narrow living room spaces. For anyone with a more traditional design aesthetic, the gold legs and white marble make for timeless appeal. A marble desk lamp for the home office. We love Target because their home store is always full of affordable surprises. Case in point, this faux marble lamp that would work as well on a desk as it would at your bedside or in an entryway. A sophisticated holding place for tiny keepsakes. As a treat for yourself or a gift for a housewarming or other occasion, a marble box like this will make the recipient feel so special. A scented candle you won't mind displaying. We love a good scented candle, but the labels glued onto glass jars are not always the best look. This scented candle from Target is discreet and affordable—just the way we like it. This floor lamp has a minimal and somewhat industrial feel which will work well in almost any home design scheme. Position it over your favorite reading spot for a cozy and well-lit solution. A stylish wall clock to keep you prompt. Is it time for an update to your kitchen or entryway? Sorry, we couldn't help ourselves but this stylish faux marble wall clock inspires puns and purchasing—plus we love the dash of pink! If you're going to drink a fancy cocktail at home, you should have a fancy coaster to go with it. We love these weighty, stylish marble coasters from West Elm that look perfectly paired with a cut crystal Old Fashioned glass. A marble pedestal for artful kitchen displays. Like a painter's still life in real life, use this marble pedestal to display fresh fruit in your kitchen—or take it to your dining room for cheese and charcuterie when guests come over. Also, this one gets extra points because it's dishwasher-friendly! A flatware set to spice up every meal. Give your usual at-home meal an upgrade with this set of faux-marble flatware from one of our favorite affordable home stores—Wayfair. A light switch cover for a funky touch. For just $6 you can give your boring light switch an instant makeover with one of these covers from Etsy. If you're ready to take your home bar game to the next level, allow us to introduce you to West Elm's Deco barware collection. Gold and marble pair perfectly and may just inspire you to start whipping up some mixology-worthy cocktails in your living room.